Although pronunciation questions do not fall directly into the field of grammar, people frequently ask me about how certain words should be pronounced. The five most frequent inquiries are how to pronounce: "either," "neither," "tomato," "harass," and "Caribbean." Just looking at them and following the regularly accepted standards of pronunciation, one would think there should be little question about how they should be pronounced. But not so! Let's take a look individually at each of the five words. The word is pronounced two ways, with the accent on the first syllable in both, one starting with an “e” sound and the other with an “I” sound: <strong>e</strong>-ther or <strong>i</strong>-ther. I use as my primary authority for the correct pronunciation <em>Merriam-Webster’s Collegiate Dictionary.</em> Most authorities on grammar and pronunciation agree that this is consistently the most reliable and scholarly source. It may come as a surprise to many people that <strong>e</strong>-ther is used appreciably more than <strong>i</strong>-ther. 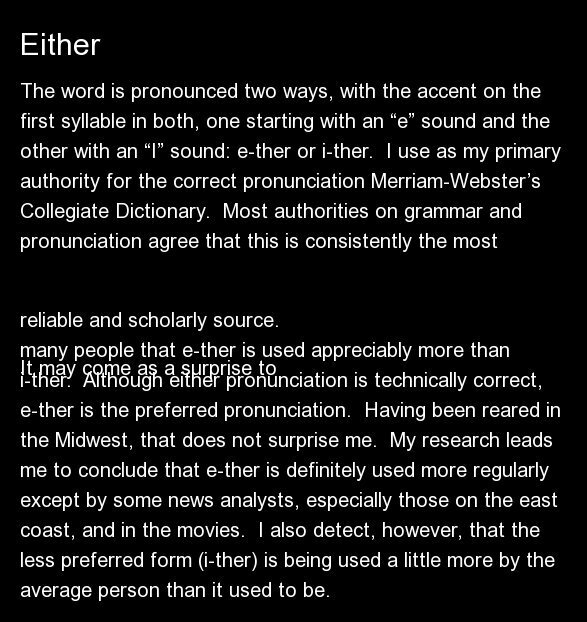 Although either pronunciation is technically correct, <strong>e</strong>-ther is the preferred pronunciation. Having been reared in the Midwest, that does not surprise me. My research leads me to conclude that <strong>e</strong>-ther is definitely used more regularly except by some news analysts, especially those on the east coast, and in the movies. I also detect, however, that the less preferred form (<strong>i</strong>-ther) is being used a little more by the average person than it used to be.